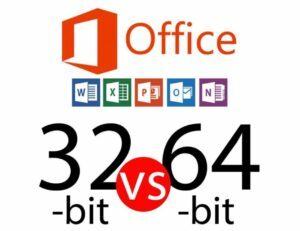 SOLVED: Why Is 64 Bit MS Office Now Recommended? Microsoft has changed their guidance to state that from September 2018 on, they recommend the 64 bit version of Office be installed. This is a departure from the 32bit guidance Microsoft provided previously. Your PC Operating System had to be 64 bit but in 2010 only about 90% of PC’s ran a 32bit version of Windows (see the table to the right). There were no 64 bit plug-ins. If you had an addin for Outlook, Excel, Word… it was guaranteed to be a 32 bit plug in because that was all that existed at the time. Maximum limits of memory storage and file size for Data Model workbooks 32-bit environment is subject to 2 gigabytes (GB) of virtual address space, shared by Excel, the workbook, and add-ins that run in the same process. A data model’s share of the address space might run up to 500 – 700 megabytes (MB), but could be less if other data models and add-ins are loaded. You’re using SharePoint Server 2010 and you need the Edit in Datasheet view. You can continue to use the Edit in Datasheet view functionality in SharePoint Server 2010 with 32-bit Office.